Warhol’s iconic portraits attest to the lasting achievements and fame of these singular figures. Originally published as a portfolio of silkscreen prints on paper, Warhol was so pleased with the commercial success of his Ten Portraits that he decided to create additional versions of the series as silkscreen paintings on canvas. The Jewish Museum initially showed three sets of paintings and an edition of prints in the fall of 1980. On view in this exhibition are one of the five complete sets of ten paintings, an edition of the final print portfolio, several sketches, a preparatory collage, and the photographs that Warhol used as source images, offering new insights into their development and historical context. Sigmund Freud was an Austrian neurologist who famously became known as the founding father of psychoanalysis. Freud’s development of this new therapeutic technique involved methods of dream analysis, along with what is referred to as the “talking cure,” where patients would speak and recall memories in an attempt to reduce the severity of symptoms. While there have been improvements and expansion on his varying theories, Freud remains recognized for his contributions to psychology and is a highly influential historical figure. His work in the development of therapeutic treatments and theories, including his work with the unconscious and dreams were very influential outside of the medical field as well. Notably, artists in the surrealist movement, took to his ideas of accessing the unconscious and put them to work in their art practices. 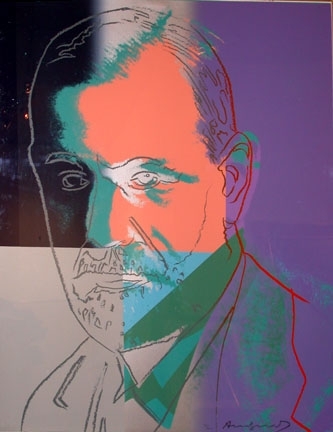 Sigmund Freud is a part of Andy Warhol’s Ten Portraits of Jews of the 20th Century. Freud’s psychoanalysis aimed toward developing therapeutic practices to deal with trauma. Warhol, in many of his works, also investigates trauma, how it is translated through image and the effect image can have on trauma or on traumatic content. Warhol was prolific in creating portraits of celebrities and was well known for his fascination with fame. It is noted that Warhol’s portraiture tends to reveal only the surface of a subject, just their image. In this series of portraits, the type of celebrity Warhol deals with is not so glamorous or typical of his usual pick of movie or rock stars. Each portrait is of a very influential figure in either the arts, sciences, or law. Andy Warhol was an American artist who was a leading figure in the visual art movement known as pop art. Andy Warhol’s works explore the relationship between artistic expression, celebrity culture and advertisement that flourished by the 1960s. Andy Warhol’s Marilyn and Andy Warhol’s Soup Cans are some of the most recognized and collectible of his artworks. From Andy Warhol Paintings to Andy Warhol Prints and unique pieces, the artist’s works are available for sale from Guy Hepner.